A slug with shell envy finds a worthy surrogate—and then something even better. 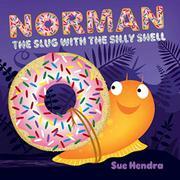 With a fine disregard for logic, internal or otherwise, Hendra sends her bright orange slug out to find a shell so that he can join the smiling snails in their play. After failed experiments with a tennis ball, an apple, and an alarm clock tied on his back (neat tricks, considering his total lack of limbs), he straps himself beneath a discarded doughnut. This draws a bird (“Quick, slither for your lives,” counterintuitively cry the snails to one another) that carries Norman off. Sliming himself free of the doughnut (which the bird also drops, for some reason) in midair, Norman falls onto a clothesline. The surprisingly nonharrowing experience has made him eager now to take to the air, so he somehow turns a pair of underpants into a stiff glider. Off he flies with a “Ta-da!” to leave readers admiring his resourcefulness and also, more than likely, disoriented by the story’s arbitrary swerves.